The Events & Announcements widget’s purpose is to publish events or announcements that shouldn’t be on Localist, our University Calendar. If you have events that are not open to the general public or only for a specific audience, then it makes sense to use this widget instead of the more robust Localist Events Feed widget. You’ll need to choose whether you’d like to create a list of Events or Announcements. 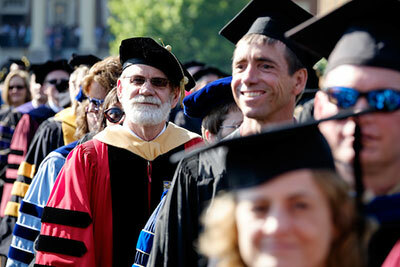 Events will display the date(s) of the event and allow you to add a photo on your detail page. 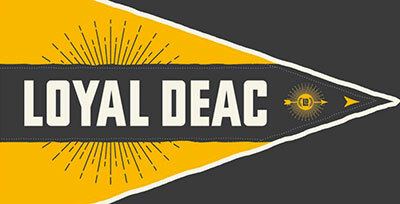 Announcements will be simpler with no date attached to the posting. 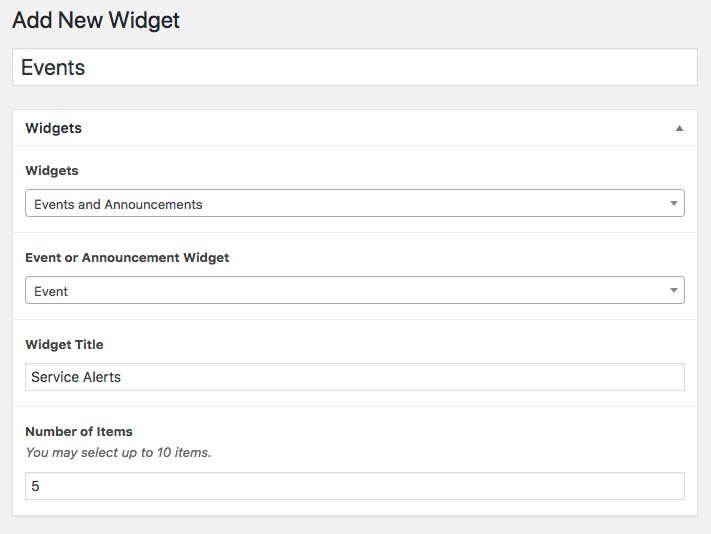 You can only display one post type in your widget but you can have multiple Events & Announcements widgets on one page. To begin building your Events & Announcements widget you’ll need to create posts to populate the widget. Create the posts by navigating here: WordPress sidebar > Events & Announcements and then click the Add New Event & Announcements button. 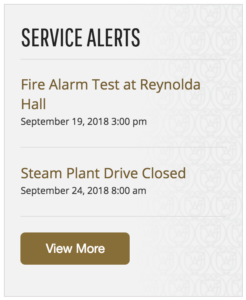 Begin by adding the title of your posting that will be displayed on the widget, then choose “Event” or “Announcement” from the Select Event or Announcement dropdown. 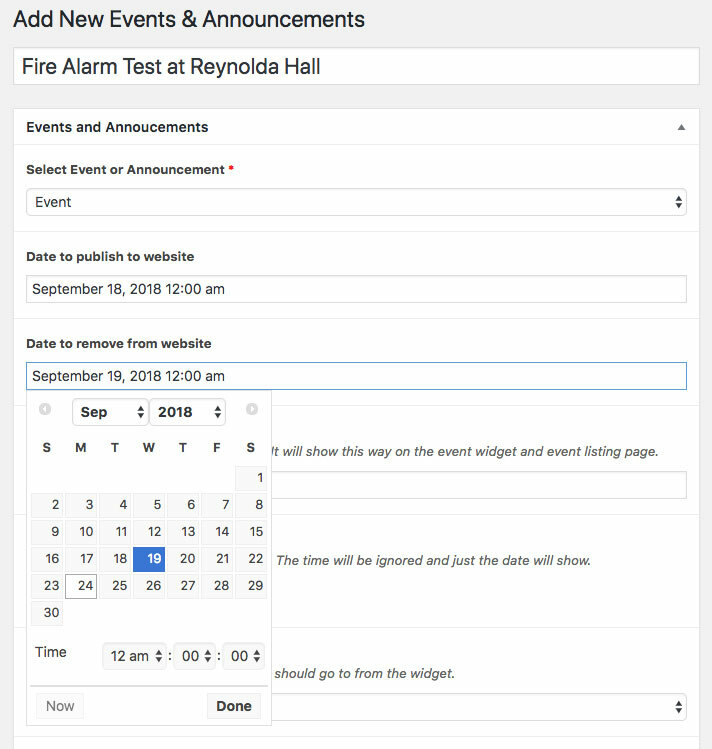 Choosing “Event” will display additional fields for “Date Display” and an optional “Event Image” that will be displayed at the top of the event’s detail page. Next, you will schedule when the event or announcement will be shown in the widget and when it will be taken down using the calendar tool. If you have chosen to create an event then you’ll need to enter the event date and any time range in the Date Display field. This is an open text field so you can format the information as needed. The Widget Link Type dropdown will allow you to select where the event or announcement title in the widget will link. “Internal Link” will link it to another page on your own site, “External Link” will link to a page on another site and “Detail Page” will link to a custom page created for your post. A detail page will still be created for every post and displayed to users who click on the “View More” link in the final widget. Finally, you can add the information for the detail page. Event Image is an optional image for Events, and Description is where you’ll add the description of your event or announcement. For More Information is an additional highlighted text field that you can add to your detail page if desired. Click Publish on the left side of the post to publish or schedule your Event or Announcement. Now that you have at least one post for your Events & Announcements widget to pull in you can now add the widget to a page. 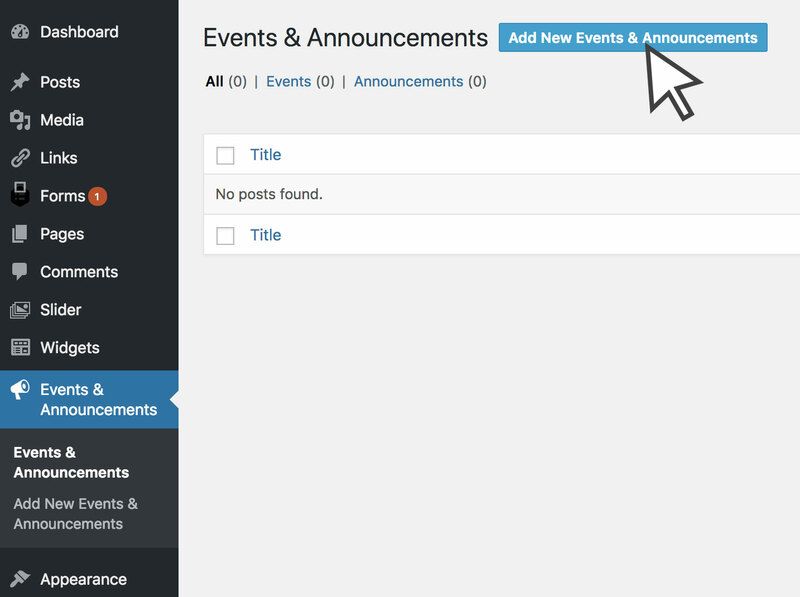 To create a new Events & Announcements widget, navigate here: WordPress sidebar > Widgets > Add New > Events & Announcements (from the dropdown). When creating a new widget, add your internal name for the widget that will appear in the content builder in your pages. 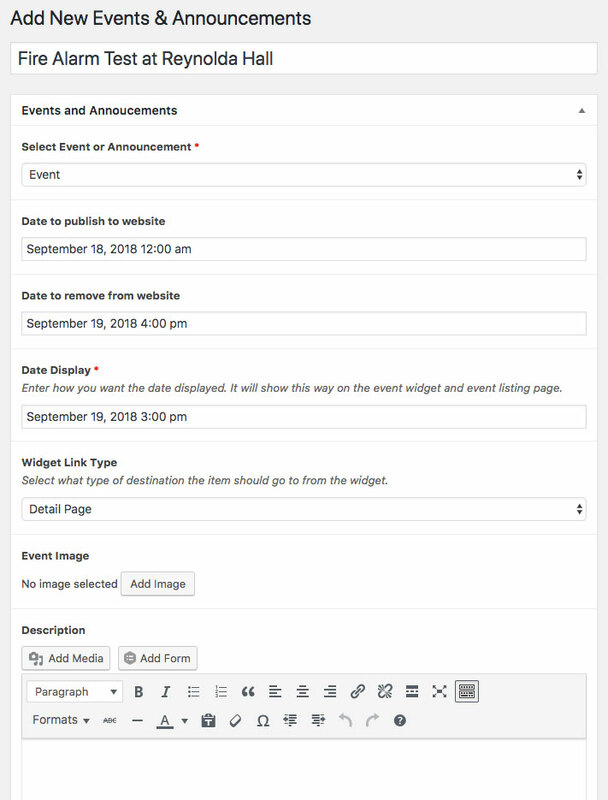 Under Event or Announcement Widget choose “Event” or “Announcement” from the dropdown to correlate with the post types you’ve already created and would like to aggregate and display. Widget Title is the publically displayed title for your widget and Number of Items lets you choose the maximum number of posts you’d like to display in your widget. Note: As your posts expire (as set on Date to remove from website in your post) they will no longer be displayed on your widget. Now click Publish in the right WordPress menu. 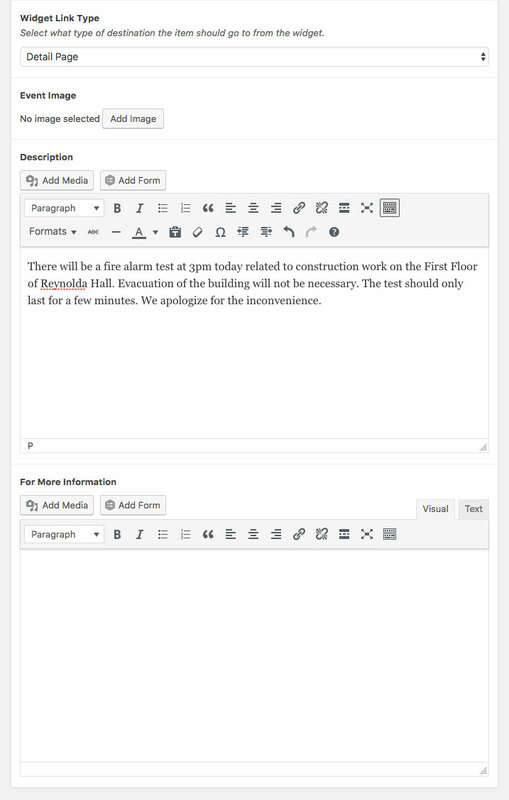 Your new widget will be available in the widget dropdown in the content builder in your pages. If you are making a change to the content of an existing widget, then click Update in the right WordPress menu and your changes will appear on all pages containing the widget without further steps. 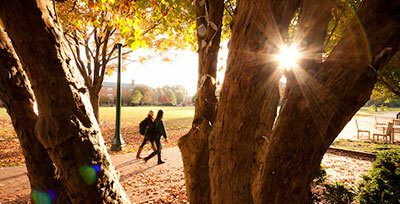 This is a guide for the content management system (CMS) for Wake Forest University websites. 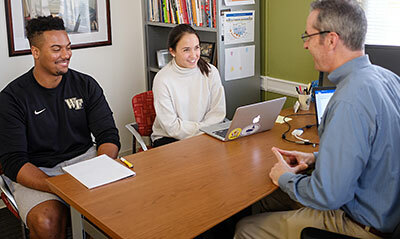 The CMS is administered by the Office of Communications and External Relations (CER).